I may end up putting this on my door. Conveniently, I leave for school tomorrow morning. niteice wrote: Conveniently, I leave for school tomorrow morning. I guess it's a personalized present from Randall to yourself. Dude, don't give away my secret. If determinism is right, does it matter that I believe in free will? For some reason this reminds me of a mate's father. He's a professor at uni, and works with flowcharts and mindmaps all the time. To the point where as part of his speech for his son's wedding he pulls out a piece of paper that we all assume is some notes.. until he unfolds it.. and unfolds it again.. and again.. and again.. until it's revealed that it's a A2-sized mindmap of stuff he was going to talk about in his speech. I just sat there thinking 'how the heck did he find a printer that could print something that big at short notice?' (He was still finalising it on the night before the wedding. He must have an awesome home printer. Last edited by glasnt on Mon Aug 24, 2009 4:05 am UTC, edited 1 time in total. Wow, I've been a computer expert all along. ah so true. although the "ask for help or give up" box is usually preceded by "swap out all the hardware until it works"
This flowchart has a flaw. If you click a button, and it doesn't work but you've been 'trying all day', then you never get to the googling bit, nor actually trying more than one button, nor actually trying for any extended period of time. Actually, it is important to know where to find the options menu and how to recognize it (it may be disguised as either "settings" or "preferences" and can be hidden under any of File, Edit, or Tools). 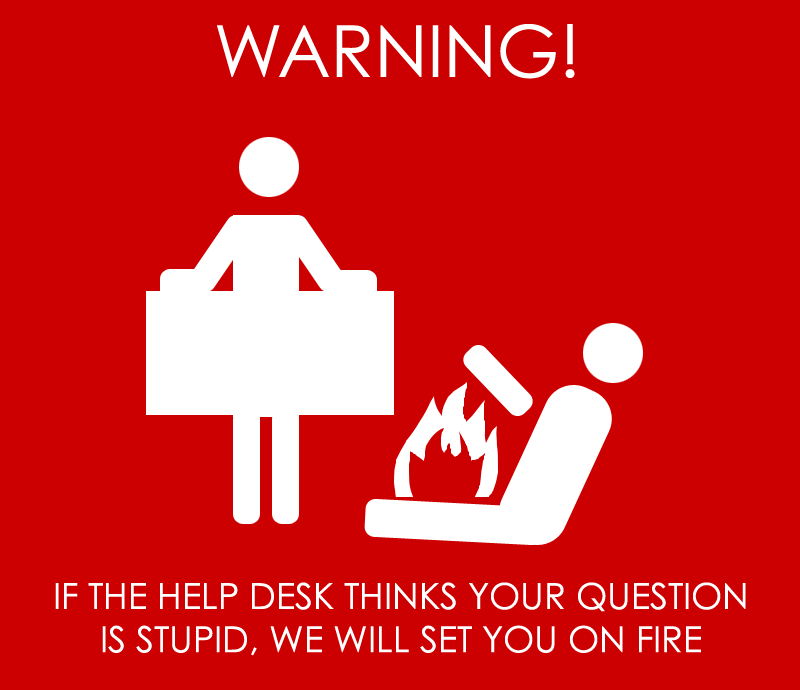 That's probably the hardest part of most of the tech support I do. Yeah, finding where the settings, preferences, or other options are is also an important step. Great comic! There should be a flowchart for every task! Though, everyone that I know that needs this chart would mistake "Start" for the start button. And, realistically, Google always comes before time-intensive labor! Last edited by Squid Tamer on Mon Aug 24, 2009 4:21 am UTC, edited 1 time in total. VHBT wrote: Actually, it is important to know where to find the options menu and how to recognize it (it may be disguised as either "settings" or "preferences" and can be hidden under any of File, Edit, or Tools). Haha, where to find preferences was one of the first things I had to figure out when I switched to Mac. It was quite annoying for the short time I didn't know where it was. glasnt wrote: This flowchart has a flaw. I think it's assumed that you will not continue to try the same button-that-looks-like-it-might-be-related, and thus run out of related-looking buttons and move on to the googling flow. Then again, assumptions should be stated in these sorts of things. Then again, people who need this chart probably wouldn't be so picky over the details as to recognize when an assumption is being made (just us nerds ). It's completely true. Some kids at school once thought I was a genius for figuring out that the music editor on the Mac could record voice. I was just like well there's a clearly-labelled microphone on the screen... let's look under File... Input... Source, let's set that to microphone, oh hey it works. Not really that difficult. The issue most people have with computer is that they look at the screen and their brains just shut down, because they've categorized computers into "not something I'm good at" and locked the door. They can be the most intuitive person on earth, a polyglot, and a prolific author, but they can't apply their mental thesaurus to 'preferences' or 'settings' and spit out 'options, the things you need to check'. And even if by some miracle they figure it out for a program they use regularly such as Word, they can't apply it to other programs. This is definitely one of the best xkcd comics ever, and I've been reading for a long time. The alt text alone is so funny. The concept in the flowchart is spot on, yet apparently hard to describe in most situations (or they just don't believe you). Gotta print this out and distribute it asap. ... I'm guessing pressing F1 is out of the question? 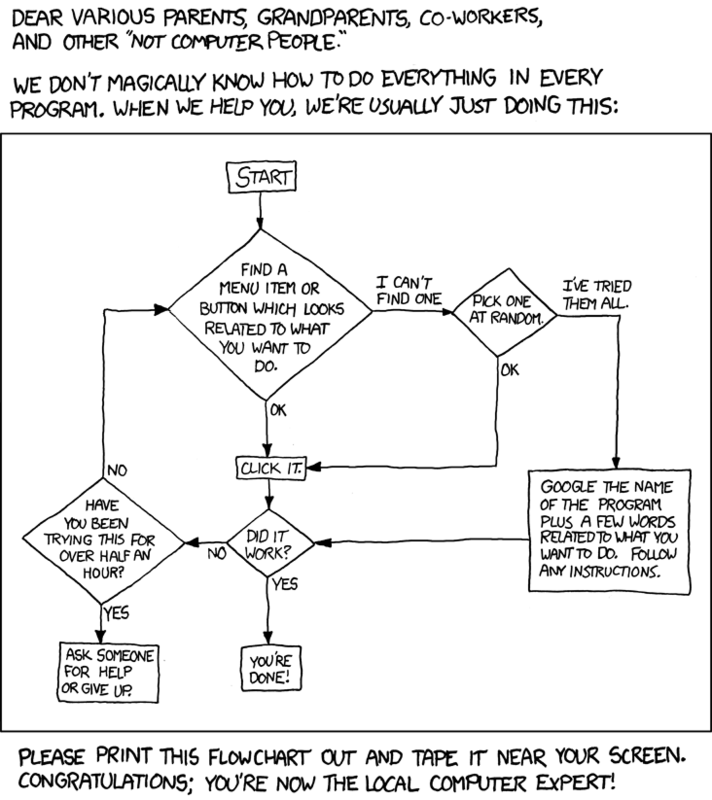 I was the local computer expert for 5 years, only because I knew about this flow chart, with the addition of "check to see if it's plugged in" and "swap around hardware". And there's a couple of special boxes for printers. "Pull out the piece of paper that got stuck", "reset the printer" and my favorite "hit it until it works". You'd be surprised how often the last one works. Funny, but Randall has made earlier comics that don't seem to hold you by the hand through the joke. The comedy would have been sharper had all the text "outside" the flowchart been omitted, and yet we all still would have got it. CrispyCrew wrote: Funny, but Randall has made earlier comics that don't seem to hold you by the hand through the joke. The comedy would have been sharper had all the text "outside" the flowchart been omitted, and yet we all still would have got it. Except its not just a joke. This is intended to be actually useful, and context is useful. Don't look at thing with such a narrow mind. Finally, something I put up whenever I'm asked about stuff. Another problem is, what if you click through all the related buttons so quickly that by the time you run out and have to start googling, it still hasn't been over half an hour? Then if it still doesn't work you'll have to try a button you've already tried! Whenever I go out on a tech support job, I like to wear a shirt related to the problem. For example, I have a nice BSoD t-shirt that a friend gave me for Christmas. Please, please make a t-shirt out of this one. And here I thought it was just me who did this! guess I am a computer expert after all!! I need to print this out for that one guy at work who just can't seem to grasp computers. He was amazed that I knew he had left himself logged in on one of the computers. He figured I knew it was him because I'm "more computer savvy" than him. Or it could be that I just looked at the top of the start menu where his name was in giant letters. He also can't deal with the one program that we have to use every day that won't let a person copy by right-clicking. It's called "ctrl-c", it isn't that hard! Ah-ha! Next time I'm home I need to print this out and stick it to both my parents computers. At least once a week I get a call from my mom about a problem she or my step-dad is having that I eventually solve pretty much exactly like this. I love the comic, but I am concerned as a IT support person that if the secret gets out, will I have a job edumacating the computer semi-literate? I think we need a poster-sized version. If this included the step, before Googling, of "find the manual and look it up", then this would be exactly how I figure out new programs. I actually really enjoyed this one as I get many ask's for help each day.